If you’re used to just talking about styles and preferences, Everything DiSC’s use of dots and priorities might be a little confusing. 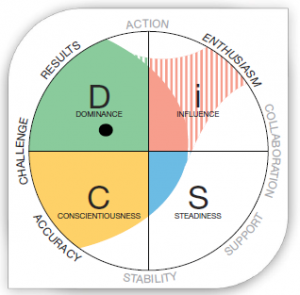 Everything DiSC is about much more than just a single letter or two denoting your personality style. It’s so much richer. 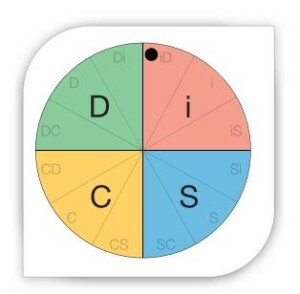 Each person who takes an Everything DiSC assessment has their dot plotted on the Everything DiSC map. The example at right shows a person who tends toward the i region, but also somewhat toward the D region. This represents an iD style. This person, therefore, is probably particularly outspoken, active, bold, and persuasive, as these qualities generally describe people who share both the i and D styles. If you look at the DiSC map for several people you’ll notice that not everyone’s dot is placed at the same distance from the center. That distance is also meaningful. People whose dots fall toward the edge of the circle are said to be much more inclined toward their DiSC styles. The style characteristics of someone with their dot near the outer edge will be much more pronounced than for someone whose dot is closer to the center of the circle. The shading around the dot provides a rough approximation of the person’s comfort zone. In the example at right, this person with a C style will find behaviors such as analysis, caution and showing will come easily. Conversely, behaviors associated with the styles with little shading (showing enthusiasm, being optimistic, compromising) will require more conscious effort. The shading reinforces the message that we are all a blend of all four styles. The shading also includes the three priorities closest to a person’s dot. 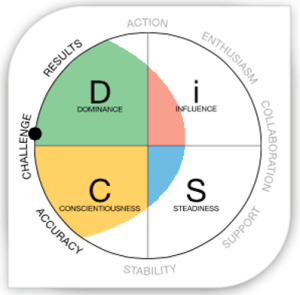 In our example from Everything DiSC Workplace, these are accuracy, challenge, and stability. The priorities are an additional measurement unique to Everything DiSC. As the Everything DiSC Manual explains: “the priority scales measure much more narrow constructs. For example, the i DiSC scale measures a sociable, lively disposition. The priority scale of Enthusiasm measures only liveliness.” This provides a more nuanced feedback in the resulting profile. Not all people with the C style, for example, are the same. Some people will show more than three priorities. Their DiSC map will include extra shading if their score on the priority is over a pre-set threshold. The example at right show an additional priority of enthusiasm for this D-style individual. 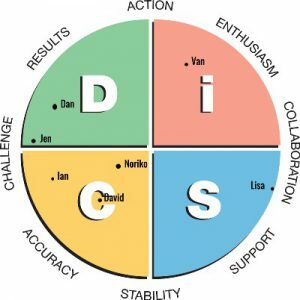 If you’re really intrigued by the results of an Everything DiSC assessment, you might want to take a look at the Everything DiSC Supplement for Facilitators. It’s a one-page report that provides you with more detailed data about a respondent’s DiSC style and dot placement. It provides the questionnaire items a person rated highly but aren’t typical for someone with his or her style. It also shows the respondent’s scores on all eight priorities.